called The Intern. Bront, whose real name is Nasrul Suhaimin Saiffuddin, will be helming this project. The story centres on a young graduate who becomes an intern at an advertising agency. On her first day, she is bullied and forced to work alone, late into the night. A blackout occurs and the intern finds herself trapped in the office with all the doors locked. night in terror in the dark, finding ways to keep herself safe.During a recent interview in Kuala Lumpur, Bront shares some details of his new project. “We are trying to get a famous name to play the intern, as we want to sell the film all over China and internationally,” says Bront, who held auditions for actresses from Hong Kong, China, and Korea. At the moment, they are in talks with a certain actress, but Bront is keeping mum on any further details until the deal hasbeen signed. Bront, who wrote the first draft for the script, says the film will be set over a period of 24 hours, with over 90% of scenes taking place in an office. “I am planning to build the office set from scratch, so I can better control the environment when I am shooting the film,” he adds. New Zealand, the United States and Australia. “I still can’t believe that my face will be [on] a big screen in 30 countries,” says Bront, who plays a father to four children in the film. His performance earned him a nomination for best supporting actor at the Festival Film Tempo 2017 in Jakarta. However, Bront lost out to another Malaysian actor, Chew Kin Wah, who won for his performance in the comedy drama film, Cek Toko Sebelah. But the actor quickly adds: “Frankly speaking, I love him like a brother. He is the one who recommended me for Belukar (for which Bront won the Malaysia Film Festival’s best actor award in 2010). Bront himself is also more than happy to seek roles further afield. He recently completed shooting a Philippine horror film called Daddy’s Home. That film is directed by award-winning Malaysian filmmaker Bradley Liew, who is based in Manila, and produced by Philippine producer Bianca Balbuena. It will likely open in cinemas here early next year. 1, 2, Jaga, which has been in production for three years. The film, which is directed by Namron, deals with the hot-button issues of police corruption and illegal immigration, and stars Rosdeen Suboh, Zahril Adzim, Ameriul Affendi, Vanida Imran, and Azman Hassan. 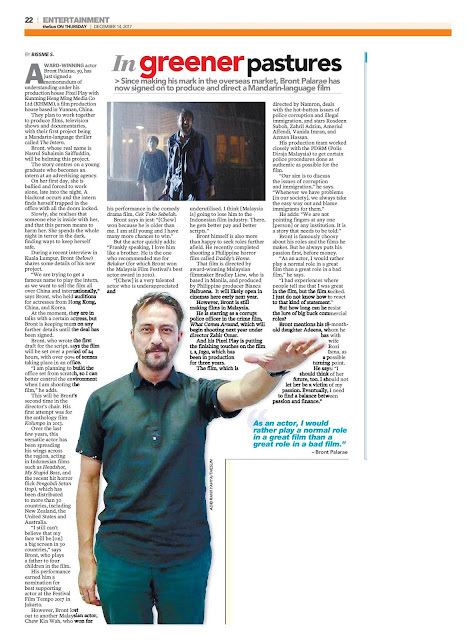 His production team worked closely with the PDRM (Polis Diraja Malaysia) to get certain police procedures done as authentic as possible for the film. “Our aim is to discuss the issues of corruption and immigration,” he says. Bront is famously choosy about his roles and the films he makes. But he always puts his passion first, before money. “As an actor, I would rather play a normal role in a great film than a great role in a bad film,” he says. But how long can he resist the lure of big buck commercial roles? Bront mentions his 18-month old daughter Adeena, whom he has with wife Rozi Isma, as a possible turning point.